The new James Bond film, Skyfall, will be headed to IMAX. It will be the first film in the franchise to go IMAX and will be release simultaneously with the film’s November 9th release date (October 26th internationally). It should be noted that Skyfall is not being shot in IMAX. It’s being blown up to meet the larger screen size. The trade-off is that while Bond gets bigger, he also gets more pixilated (at least in the movies I’ve seen; other people don’t see this problem). In other IMAX news, THR reports that IMAX plans to be part of more early release windows like they were with Mission: Impossible – Ghost Protocol. However, there’s no word on whether or not Skyfall will be one of those early releases. Hit the jump for the press release regarding Bond’s move to the really, really big screen. IMAX Corporation, Albert R. Broccoli’s EON Productions, Metro-Goldwyn-Mayer Studios, and Sony Pictures Entertainment today announced that the long-awaited next chapter in the famed James Bond franchise, SKYFALL, will be released in IMAX® theatres simultaneously with the film’s international release on Oct. 26, and its domestic release on Nov. 9, 2012. This is the first IMAX installment of the iconic Bond film franchise. SKYFALL marks the return of Daniel Craig as Ian Fleming’s James Bond 007, as well as Judi Dench reprising her role as M. The film also stars franchise newcomers Ralph Fiennes, Javier Bardem and Naomie Harris. The film is directed by Sam Mendes from a screenplay written by Neal Purvis & Robert Wade and John Logan. Michael G. Wilson and Barbara Broccoli are producers. 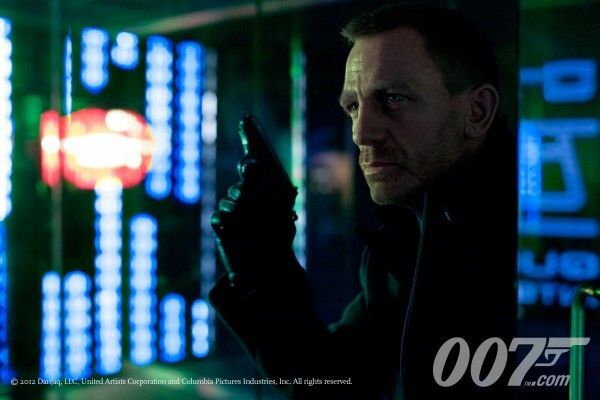 “SKYFALL will be the cool, must-see event release of the fall, and releasing the film in IMAX only reinforces that,” said Rory Bruer, President, Worldwide Distribution for Sony Pictures Worldwide Marketing and Distribution. “It is fitting that with SKYFALL marking the 50th Anniversary of the James Bond franchise, we celebrate in epic style and what could be more larger-than-life than IMAX joining the festivities,” said Gary Barber and Roger Birnbaum, Co-Chairman and Chief Executive Officers of MGM. The IMAX release of SKYFALL will be digitally re-mastered into the image and sound quality of The IMAX Experience® with proprietary IMAX DMR® (Digital Re-mastering) technology. The crystal-clear images coupled with IMAX’s customized theatre geometry and powerful digital audio create a unique environment that will make audiences feel as if they are in the movie.